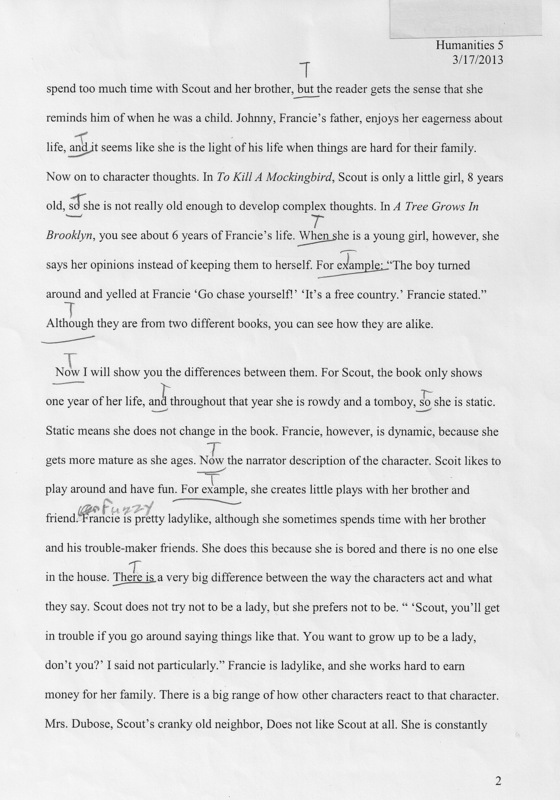 Second Draft – Having made the changes to her draft, she gave her paper to another student to have it scored for her. You can see the remarks he made on her paper. Because they were specifically looking at the trait of Organization, you will notice that he marked transitions as he saw them. He also used the language of the rubric to give her feedback. He first gave her a three out of five based on the rubric, but upon reflection, upgraded it to a 4, a fair score. Notice that he does not comment on grammar and mechanics, that will be the focus of the next draft. She will take his recommendations into account and put them in play when revising for her third draft. What she is talking about is called “Anchoring”. I learned it at a conference when I worked for the Gilroy Unified School District. GUSD called in Education Northwest to show us about the 6+1 Writing Traits. Now, I know I’ve sung their praises before so I won’t go there again. However, over the years, I have continued to use their anchoring process with very little changes. 1) I give all students a rubric which states various levels proficiency on a trait. We read it through, and although they will tell me they understand it, their understanding is tenuous at best. They need to see it in action. 2) I provide students with a model paper. 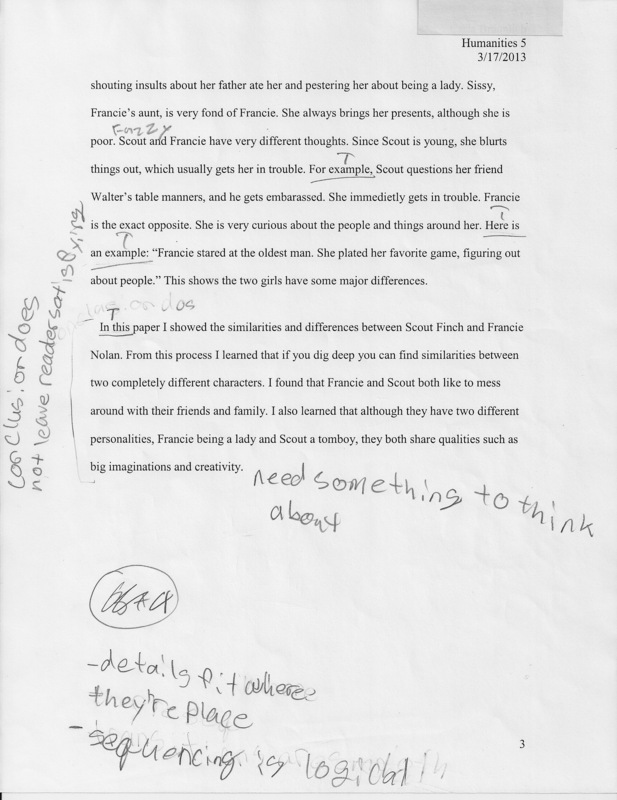 These papers are unadulterated (as in, no adult has done anything to the actual work) student created papers. They are all middle and high school writers. It means a lot to my students to see work from people their own age. I’ve been doing this long enough now that I have amassed a fair number of student papers, but I also still use papers provided to me at that conference years ago. It is important that only the work can be seen. Students will make inferences based on name, gender, length, even type-face, and date. I also never improve a paper or mangle one. Students can always tell when a paper has been mucked about with, and they won’t take it seriously. I learned the hard way to be honest with my yahoots if I’ve edited a paper. 3) This is the point where I give the lecture on treating each scholar with respect. And I give it every single time. Every. Single. Time. A student with a low score is often working just as hard as a student with a high score. We’re not in the business of assigning personal worth. 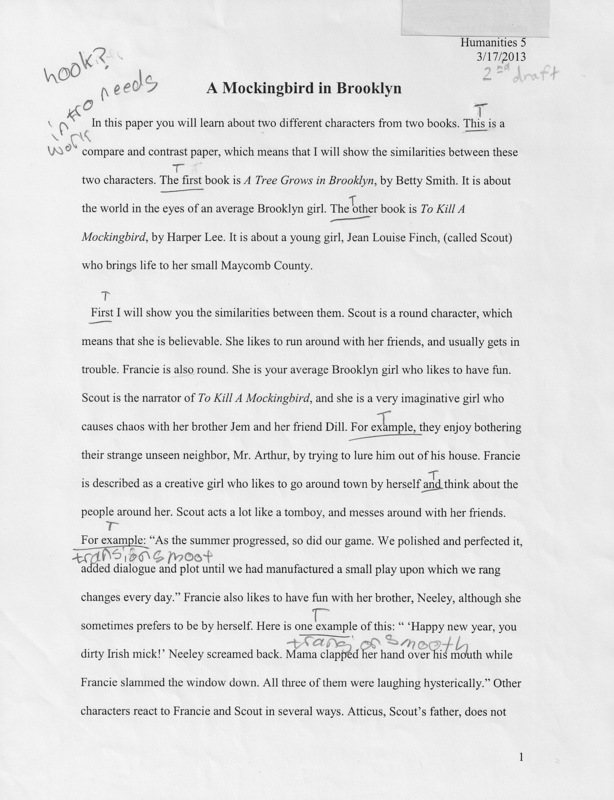 We are in the business of evaluating a paper for the quality of the writing so that the writer can make it a better paper. Even a paper with a high score can be improved. 4) Students read the paper and decide what the quality is. They are not allowed to confer with neighbors at this point. 5) Once all students have offered a preliminary score, they go to small groups where they must come to consensus on a score. They argue back and forth about why they are giving it the score and point to where on the paper they see those traits. 6) Once all groups have come to consensus, the I light up the overhead projector, and we argue our points. I mark the paper as we discuss. Again, students argue back and forth defending and proposing until the whole group is pretty well convinced. I allow myself to be persuaded in one direction or another, and I tell them so. Sometimes, it makes sense for us to start at the top and work our way down the rubric looking for evidence as we go. 7) In the end, I am the ultimate arbiter in the fate of the paper, and the students know this, but grades are not tied to the score they receive. They do not receive an A for a 5, a B for a 4, a C for a 3, a D for a 2, or an F for a 1. This would be damaging in the extreme. I know how hard my students work because they write their papers mostly in class. Often times the student who received a 3 is working harder than the student who received a 5. I reward students’ willingness to change and improve the paper and give them the feedback they need to do this. 8) (Gosh, this is a lot.) When we all agree to within a point or half-point, I hand out another paper, and we do it all again. We anchor paper after paper until I am confident that students are seeing the traits within the paper and are offering feedback which is consistent within the rubric. 9) Finally- the golden land – handing students each others’ papers for scoring. They do the same process except they do not confer with others. They read the paper twice. They mark it to show evidence. They write the evidence where they see it on the paper. They give it a score for the whole, and they conference with the writer upon handing it back. Students work with me if they are struggling to score the paper. Also, students come to me to arbitrate if they feel they have been unjustly scored. (I find it interesting that they are more likely to come to me if they feel the reader has not said enough to them about their paper.) Then the homework is to move the paper up the rubric. Students are told not to expect a great leap in scoring. It is a process that takes time and effort. Going from a 3 to a 3.5 or a 4 is an appropriate expectation. Idea and Content took two days. Organization took almost a week. Word Choice and Voice will vary by the needs of the class, but I’m fairly certain that they will go quickly because of the prior knowledge that students have amassed. For a different subject, it may be worth the time for the teacher to ask his or her students to make the rubric. (Honestly, I would create the rubric (or a couple of rubrics) and bring it in for students to develop.) Also, finding models and non-models can be very difficult, in which I might break my rule about creating them for this purpose. But I would still be honest with students about it, but then I would make copies of student work for the next time I taught this lesson.